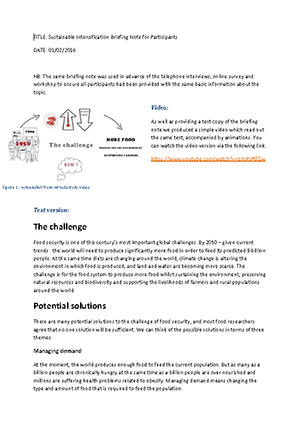 Publications, reports, resources and reviews from the Global Food Security programme. 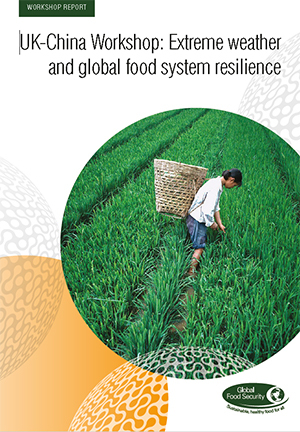 This policy brief, produced by GFS’ major interdisciplinary research programme ‘Resilience of the UK Food System in a Global Context’ (GFS-FSR), describes the importance of enhancing the resilience of the UK’s food system and how resilience thinking could be applied to the UK food system. 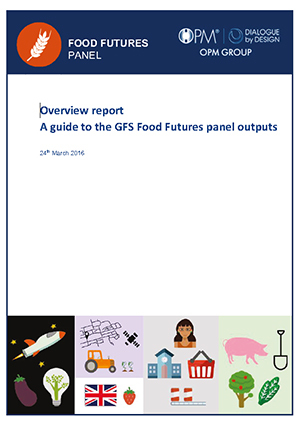 This report details a priority questions exercise conducted by GFS’ Science Advisory Group. 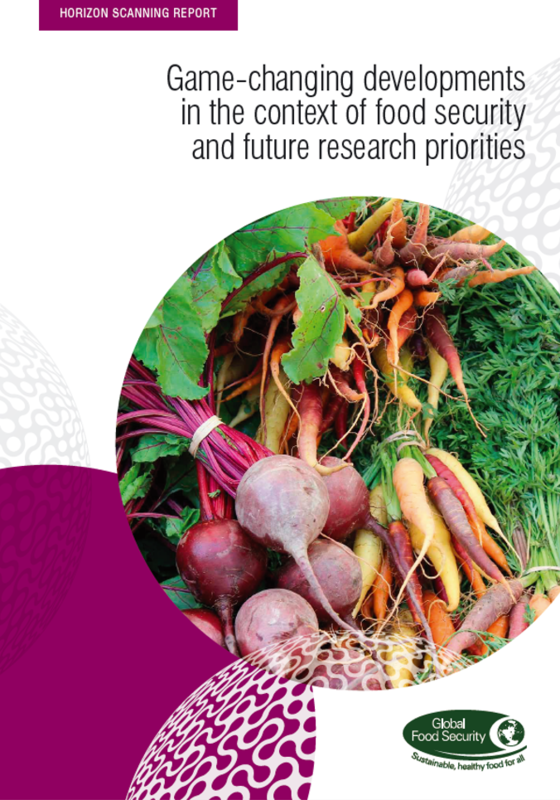 Findings highlight the latest contextual developments and research advances relevant to the food system, before drawing out a list of the top priority research questions for food security that could be addressed through interdisciplinary research. 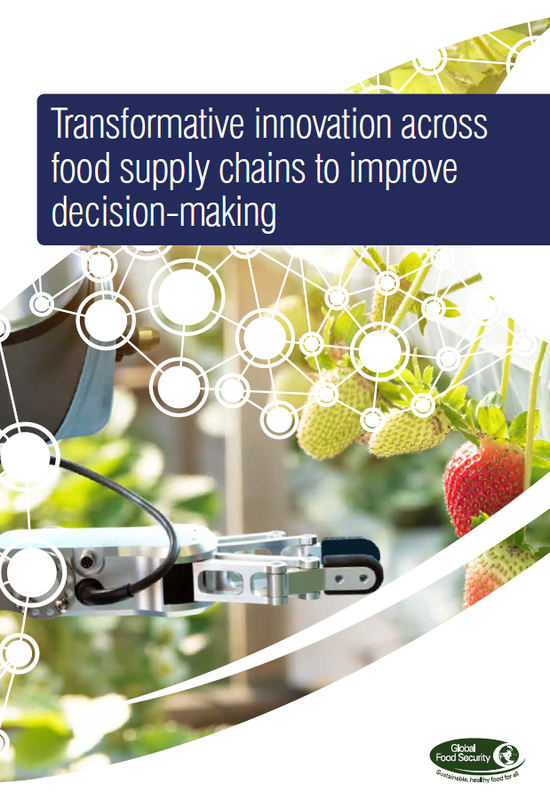 This report investigates how transformative innovation can lead to ‘business unusual’ in food supply chains, bringing together academia, industry, small and medium enterprises (SMEs), non-government organisations (NGOs) and policy makers. It examines the challenges to industry and business that technologies could address, and has provided future priorities for research, industry, and policy. This policy brief conveys five key messages for this year’s Conference of the Parties to the United Nations Framework Convention on Climate change (COP24), based on the outputs of the Global Food Security programme’s Paris-compliant healthy food systems workshop. 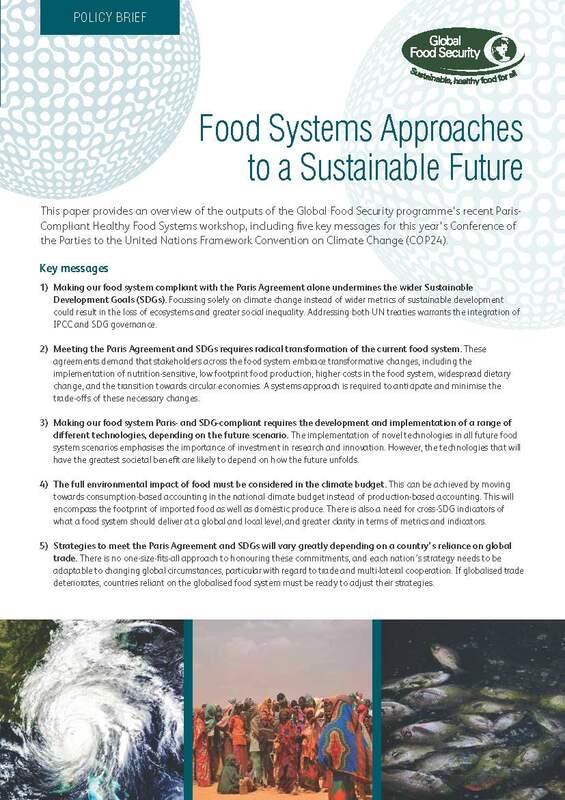 This document outlines why a food systems approach is required to meet the Paris Agreement and the wider Sustainable Development Goals, as well as to ensure future food security for a rapidly growing global population in the face of ongoing climate change. 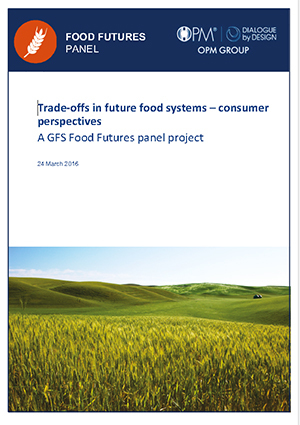 This report highlights the significant benefits for policymaking from a food systems approach. Thinking systemically and at an interdisciplinary level can help ensure that challenges are tackled from multiple perspectives and in a holistic way. Such an approach provides a way of identifying win-wins, managing trade-offs and mitigating less desirable outcomes, enabling stronger policy coherence across agriculture, nutrition, health, trade, climate and the environment, in both businesses and governments around the world. Answers to commonly asked questions about the call. This document provides guidance when completing an Equality Impact Assessment (EIA). The EIA template can be found at the end of this document. 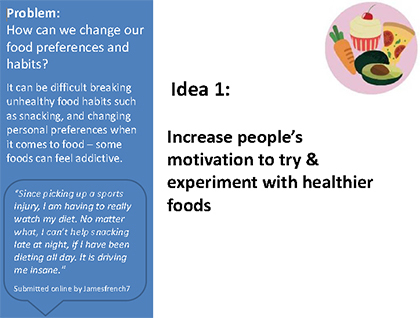 We are inviting expressions of interest from early career researchers at lecturer level or equivalent to take part in a Sandpit (2.5 days on 4-6 July 2018 followed by 2 days on 19-20 July 2018) to address the following question: How can we transform our food system so it is based on healthy and sustainable diets and how would this impact on sustainable and resilient food production and supply? 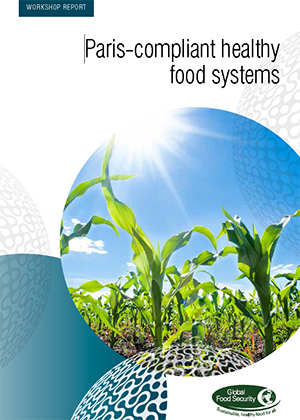 GFS Insight aims to offer a balanced and interdisciplinary representation of the current state of knowledge in a particular area relating to food security. 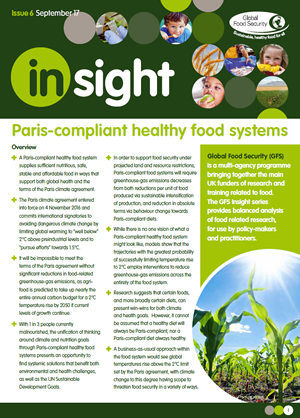 This issue outlines the need for a food system that supports both health and the Paris climate agreement, exploring impacts of food production and consumption as well as potential interventions to reduce greenhouse-gas emissions across the system. Pesticides provide numerous benefits, yet pressures on their use has led to industry exploring other viable options for pest, weed and disease management. 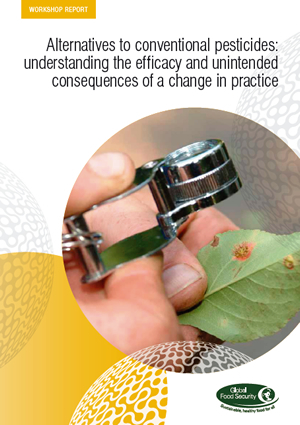 This report examines the challenges of using alternatives to conventional pesticides, and highlights future research priorities for biopesticides and Integrated Pest Management strategies. The 17 SDGs were adopted by the UN in 2015 with the aim of driving the implementation of global sustainable development. 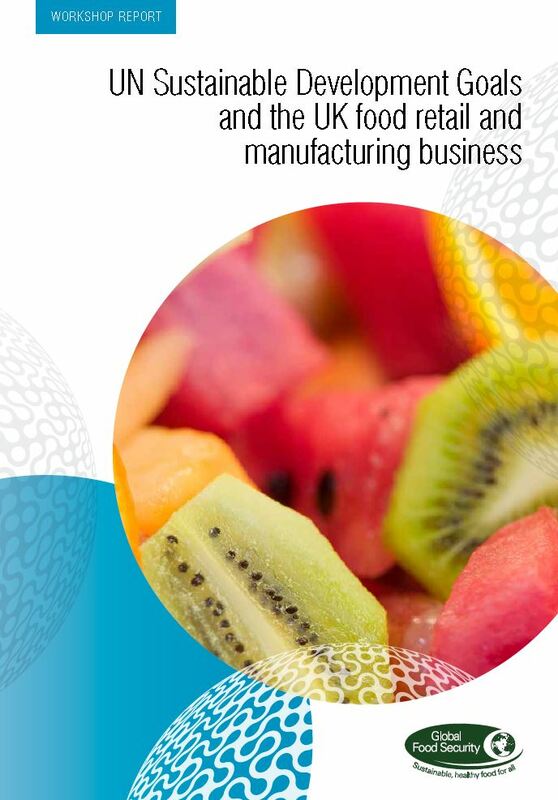 This report details discussion at an industry focused workshop exploring how far UK food retail and manufacturing businesses are prepared for and engaged with the SDGs, and how research might help them play their part in meeting the goals. 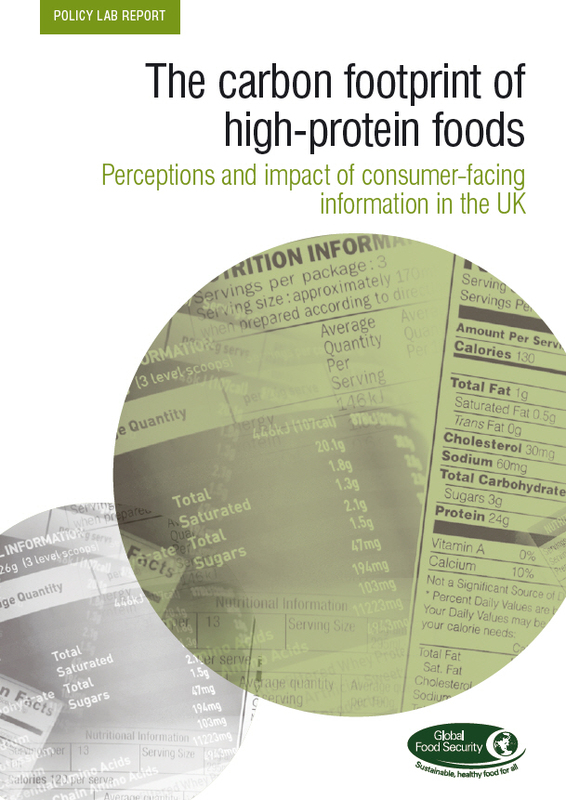 This report explores how UK stakeholders and consumers perceive consumer-facing information that shows the carbon footprint of high-protein food products. 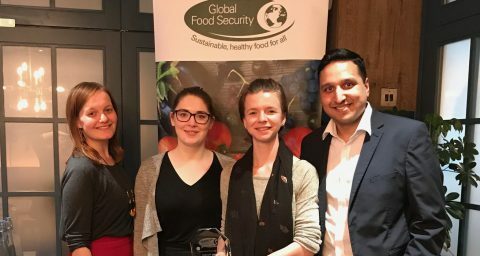 The study was funded by the Global Food Security programme as part of the Policy Lab, in which post-doctoral researchers compete to write a report for the programme. 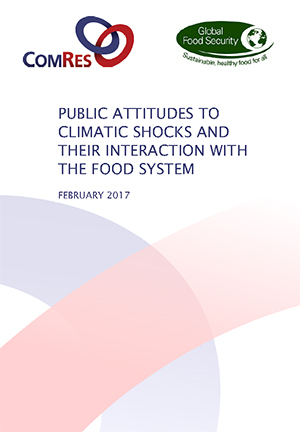 This report details the findings of a public survey, looking to gauge public attitudes towards climate change, climatic shocks and how these issues link to the food system. 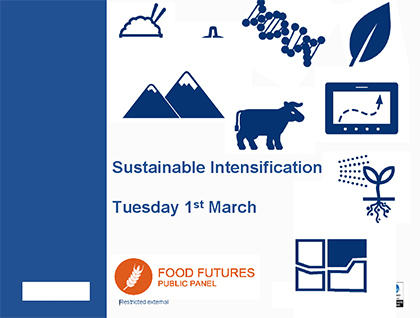 Given evidence that adaptation from across the food system will be necessary to successfully mitigate climate change, this project aimed to explore public engagement with climate issues and potential routes for food system change. 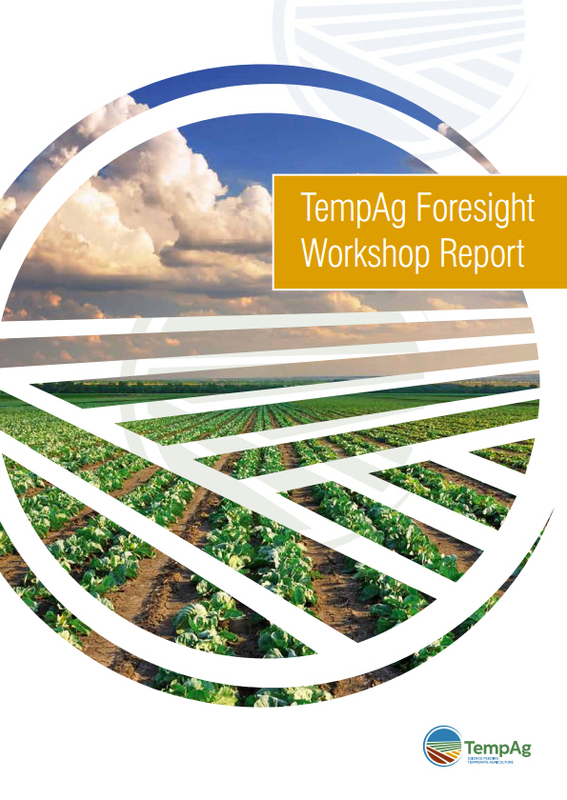 TempAg held a Foresight workshop in October 2016. 40 delegates from academia, policy, industry and professionals in the science-policy interface across 14 temperate countries participated. 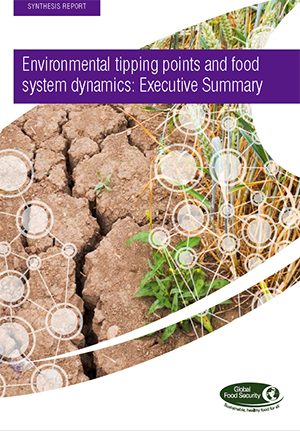 This report details outcomes and recommendations from an inter-disciplinary and inter-sectoral working group considering tipping points in the food system. Their work provides evidence for the existence of environmental tipping point as well as an exploration of their potential consequences for global food security and options for risk mitigation. Environmental tipping points occur when a biophysical system shifts from one stable state to another, potentially bringing about changes in the provision of environmental goods and services. 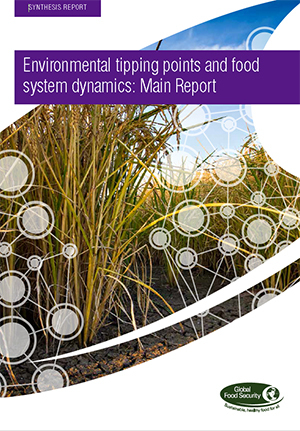 This report provides a summary of outcomes and recommendations from an inter-disciplinary and inter-sectoral working group considering potential impacts of tipping points within the food system. 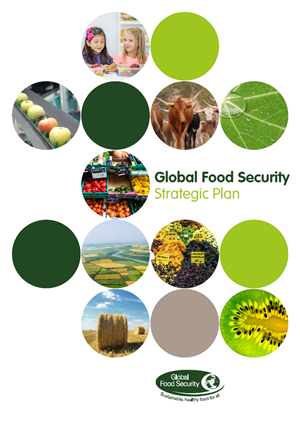 This document describes the GFS programme’s strategy, including its three programme themes and a number of interdisciplinary research priorities that would benefit from a food systems approach. With the global food system as a whole currently responsible for around 30% of total anthropogenic greenhouse-gas emissions, the agri-food sector must adapt if we are to meet the terms of the Paris climate agreement. 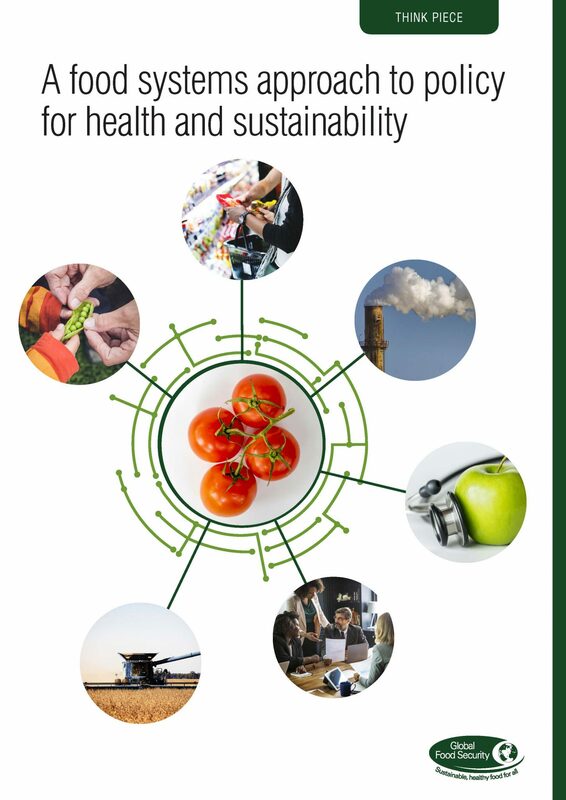 This report details discussions at an interdisciplinary workshop considering what a Paris-compliant healthy food system might look like in practice, and mechanisms by which this kind of food system might be realised. GFS Insight aims to offer a balanced and interdisciplinary representation of the current state of knowledge in a particular area relating to food security. 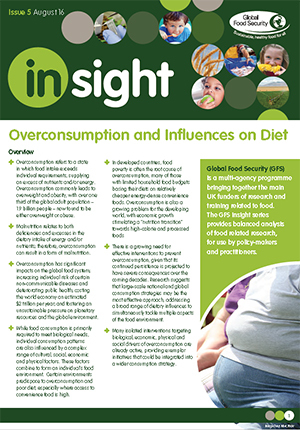 This issue outlines the global impacts of overconsumption, exploring the varied range of dietary influences that lead to overconsuming and potential interventions for prevention. GFS collaborated with the Foreign and Commonwealth Office to hold the UK-China Workshop on extreme weather and global food system resilience. This workshop report provides an overview of how extreme weather might impact food production in China, how Chinese food policy and trade might affect the global market, and a number of shared future research priorities. 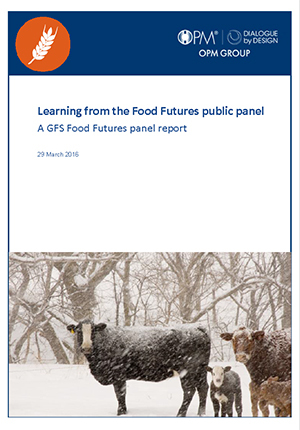 The GFS programme commissioned a panel of 600 members of the public to take part in engagement activities, exploring different aspects of food security research. This document details the stimulus presentation given at the sustainable intensification workshop. The GFS programme commissioned a panel of 600 members of the public to take part in engagement activities, exploring different aspects of food security research. 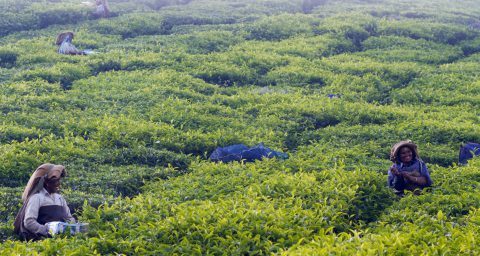 This report details findings from the sustainable intensification dialogue, outlining panel discussions on the benefits and trade-offs of sustainable intensification as an approach to agriculture. 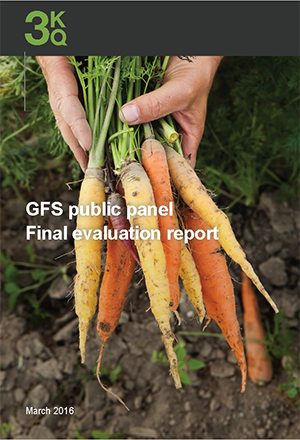 The GFS programme commissioned a panel of 600 members of the public to take part in engagement activities, exploring different aspects of food security research. This report provides an overview of the entire public panel project. The GFS programme commissioned a panel of 600 members of the public to take part in engagement activities, exploring different aspects of food security research. This report provides an evaluation of the project as a whole, including lessons learned both during and at the end of project. The GFS programme commissioned a panel of 600 members of the public to take part in engagement activities, exploring different aspects of food security research. This report details findings of the food innovation dialogue, highlighting consumer perspectives on research and development across the food chain. The GFS programme commissioned a panel of 600 members of the public to take part in engagement activities, exploring different aspects of food security research. This panel evaluation report provides an evidence based external perspective on the design, delivery, impact and credibility of the panel. The GFS programme commissioned a panel of 600 members of the public to take part in engagement activities, exploring different aspects of food security research. 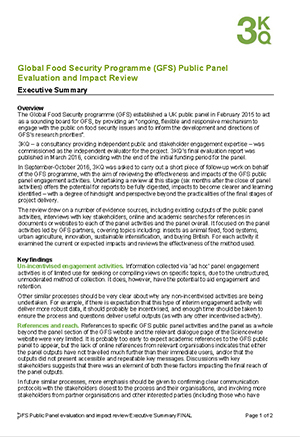 This report provides a summary of an external evaluation of the panel process. The GFS programme commissioned a panel of 600 members of the public to take part in engagement activities, exploring different aspects of food security research. This report details results of the endline survey, exploring how opinions and understandings of global food security may have changed during the panel process. The GFS programme commissioned a panel of 600 members of the public to take part in engagement activities, exploring different aspects of food security research. 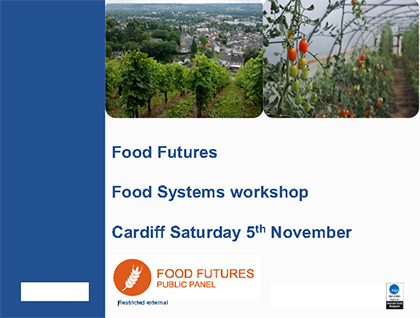 This document details the stimulus presentation given at the food systems workshop. The GFS programme commissioned a panel of 600 members of the public to take part in engagement activities, exploring different aspects of food security research. 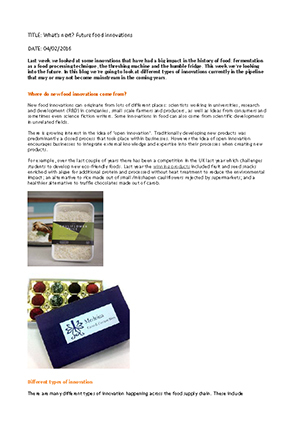 This document details the stimulus presentation given at the food innovation workshop. The GFS programme commissioned a panel of 600 members of the public to take part in engagement activities, exploring different aspects of food security research. 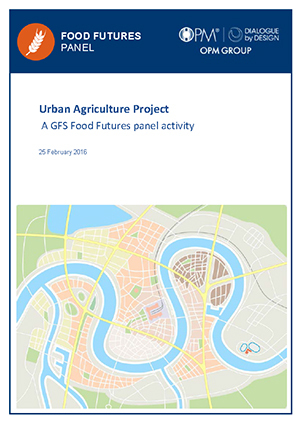 This report details findings from the urban agriculture dialogue, exploring issues associated with food production and supply for a growing urban population. The GFS programme commissioned a panel of 600 members of the public to take part in engagement activities, exploring different aspects of food security research. 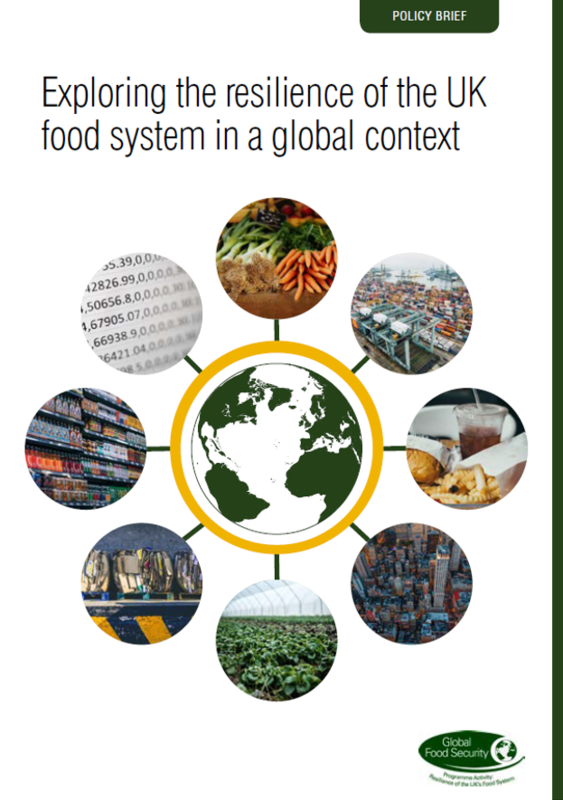 This report details findings from the food systems project, exploring public understanding the food system as a complex and interconnected set of actors and actions. The GFS programme commissioned a panel of 600 members of the public to take part in engagement activities, exploring different aspects of food security research. This document details stimulus material for the sustainable intensification dialogue. The GFS programme commissioned a panel of 600 members of the public to take part in engagement activities, exploring different aspects of food security research. 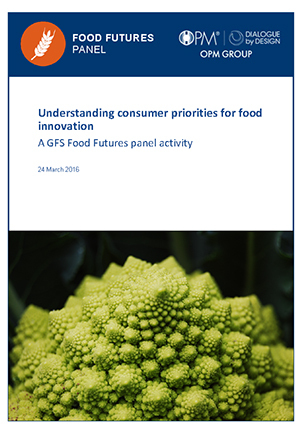 This document details stimulus material for the food innovations dialogue. This think-piece showcases new technologies with strong disruptive potential in the next decade. 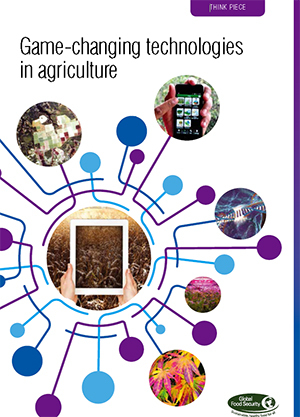 New technologies will play an important role in food security, given that in just a 35 year period the earth is being tasked with producing more food than it has in the last 2000 years combined. The GFS programme commissioned a panel of 600 members of the public to take part in engagement activities, exploring different aspects of food security research. 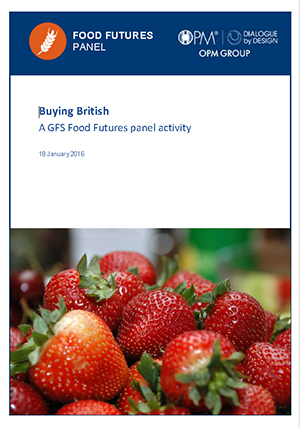 This report details findings of the buying British dialogue, exploring the cultural, attitudinal and behavioural issues involved with buying British food. 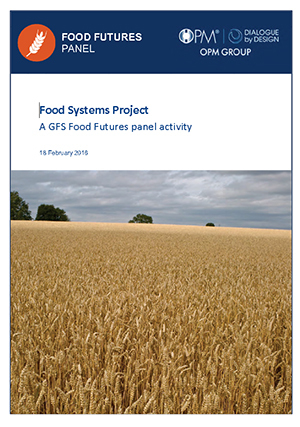 The GFS programme commissioned a panel of 600 members of the public to take part in engagement activities, exploring different aspects of food security research. 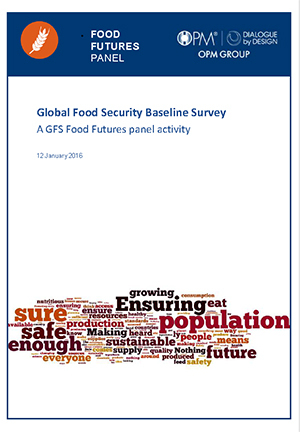 This report details results of the baseline survey, run at the start of the panel process to benchmark panel attitudes, opinions and understandings of global food security.